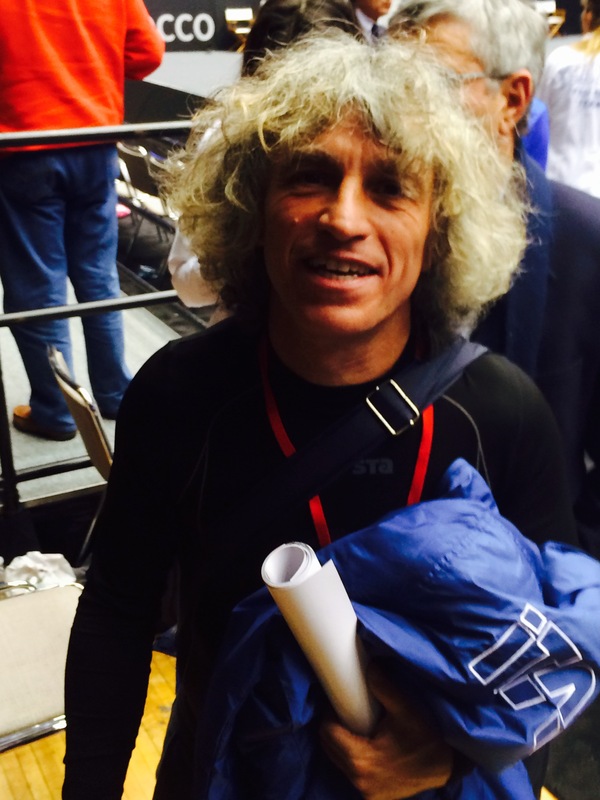 Fed Cup Cleveland: Camila Giorgi’s Dad, Down In Front! Posted in: Fed Cup, WTA. Tagged: 2014, Camila Giorgi, Cleveland, Dad, Father, fed cup, Italy, Jon Wertheim, Sergio Giorgi, Sports Illustrated, Womens Tennis, wta. After a very, very, very interesting article about Camila Giorgi’s, no, Sergio Giorgi’s woes, I swore I wouldn’t let that tarnish my observations of the man. I was sure he’d be in Cleveland the second they announced that Giorgi would be playing for the Italian Fed Cup Team. Like a fly on the wall, I observed Signor Giorgi this weekend. He guards his daughter and adores her, as much as I think I would do if my little girl ever becomes a WTA pro. He was never far from her side and he even showed up at all of her press conferences. So I like the guy. But he acts likes he’s never been to a tennis match before. On Saturday, I watched him take a photo of Camila leaning over the front row with an on-court ball boy while a point was being played in the Knapp-McHale match. I didn’t get a photo of that. On Sunday, with Knapp about to wrap up a Fed Cup victory for Italy, he was overcome with some other pressing matter during Knapp’s penultimate service game. He stood and chatted with some of the Italian hitting partners. Then, when the hitting partners had the good sense to sit down, he continued to stand and chat while Knapp went about her business 10 feet away. Steve Fogleman is Editor of TennisEastCoast.com, a Mid-Atlantic based tennis website. He is in Cleveland, Ohio covering the Fed Cup tie between USA and Italy for Tennis Panorama News. Posted in: Fed Cup, WTA. 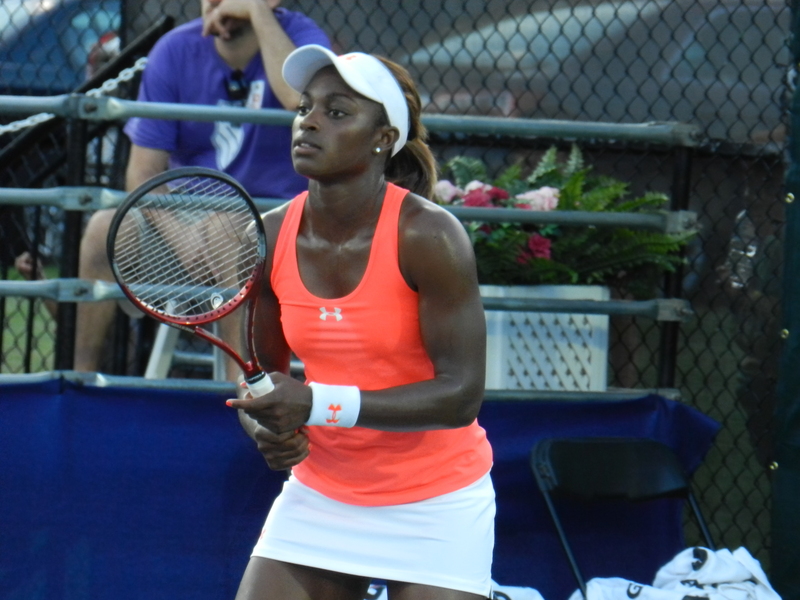 Tagged: 2014, Cleveland, doha, fed cup, Injury, sloane stephens, us, usa, wta. There’s nothing worse than that feeling when you’ve been caught in a fib by Mom. The Mom in this case is US Fed Cup Captain Mary Joe Fernandez. Veteran Freelancer Sandra Harwitt is the Helen Thomas of the tennis press (before the White House correspondent lost it). Today, she mentioned to Fernandez–almost in passing–that Stephens was playing in Doha. In fact, she’s scheduled tomorrow against Petra Cetkovska. Fernandez countered, “You sure Sloane’s in Doha? She had a wrist injury”. El Capitan was clearly caught off-guard by the news. After all, she has been quite busy for the last week. As you may remember, Stephens decided against participating in the Fed Cup tie due to a wrist injury two weeks ago. I respect and I admire my team’s decision to play Fed Cup over Doha. It’s tough. 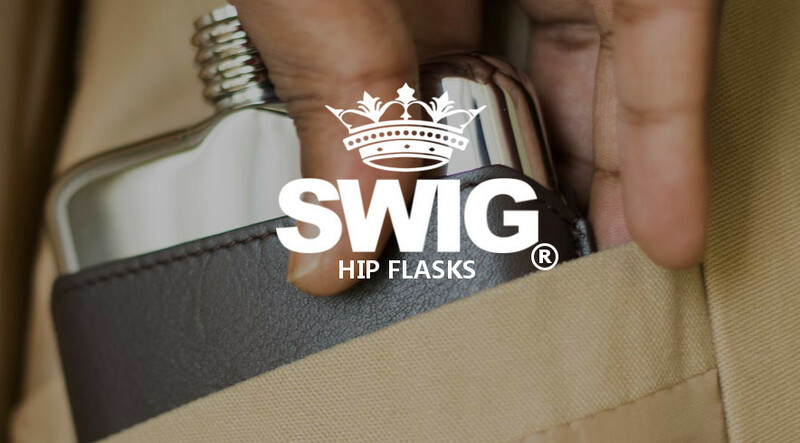 There’s tournaments every week, there’s points to be won every week. Fed Cup comes not very often. So, if you can make this a priority, I think it’s incredible and I think you get a lot out of it. As a player, it’s some of my fondest memories. But I understand the challenges. And that was one of Venus’ challenges. You have to make a decision on what’s your priorities and what’s important to you. Don’t you hate it when Mom talks like that? She didn’t scold you, but she did. Just a little bit. Posted in: WTA. Tagged: 2014, Camila Giorgi, Cleveland, fed cup, Interview, Italy, Karin Knapp, recap, usa, Win. 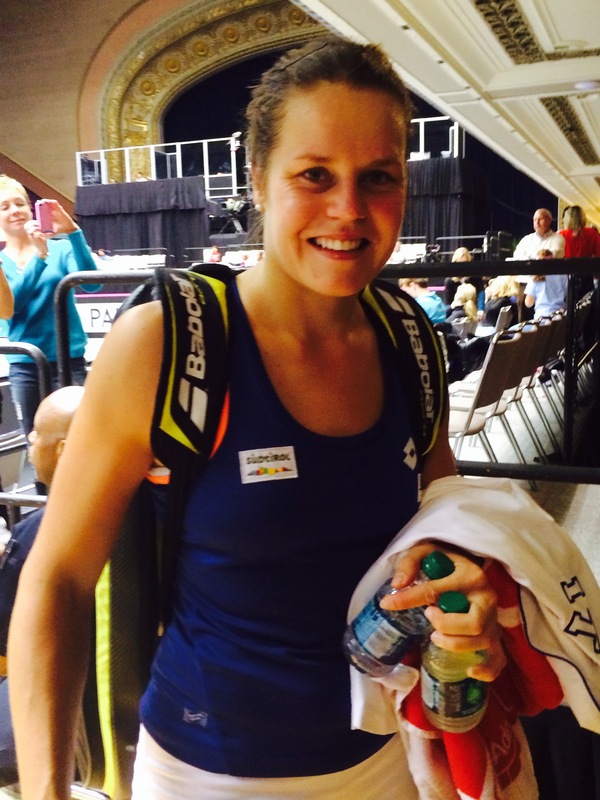 Karin Knapp followed up on her win over Christina McHale yesterday with a clinching 6-3, 7-5 victory today over Alison Riske in the first round of the 2014 Fed Cup season in Cleveland, Ohio. 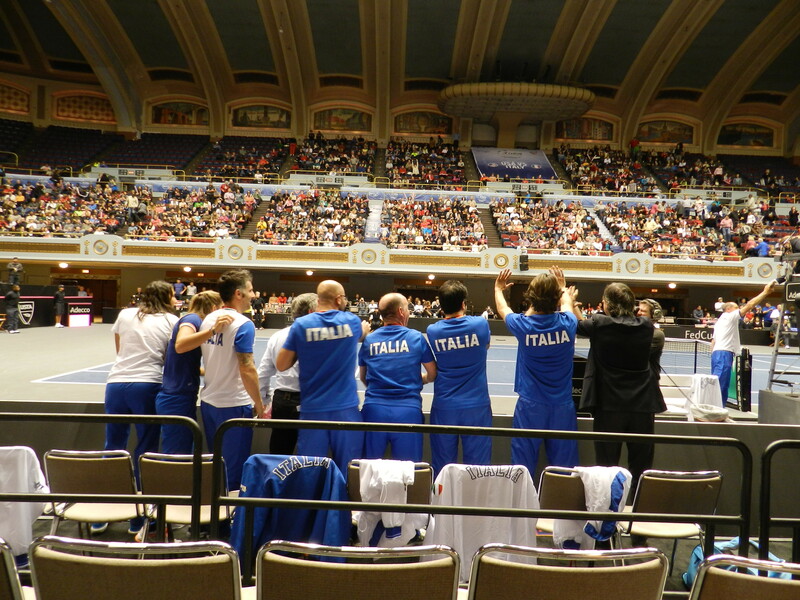 The Italians defeated the American team in all three live rubbers. Knapp did have some trouble closing it out over Riske, who was a last-minute replacement for Madison Keys in an effort by Captain Mary Joe Fernandez to get some momentum for the US. Riske acquitted herself well. She elevated her game in the second set, and after drawing even with the Italian, she was broken at 5-5 in the next game. Knapp served it out from there. Overall, the match was more competitive than it might appear. Knapp told the press that the team made a pact to jump in the Cleveland snow if they won the tie. “After this, we will all put the jacket on, the scarf on and we will jump in the snow!”, she said. No word on when and where that photo opportunity will occur, but the snowy tundra of Cleveland Public Square is conveniently located between the venue and the Fed Cup hotel. The snow didn’t stop the crowd from arriving to cheer on the US team, but it did slow them down. There were many empty seats at the start of the tie, but the fans filled in to create a boisterous cheering section by the beginning of the second set. The Public Auditorium was noticeably louder than yesterday. Riske had a “big group of people from Pittsburgh” to join her for the event. She called the tie “an unbelievable experience and noted the “awesome” support from the fans. She’ll be in training in the two weeks leading up to Indian Wells. Madison Keys and Lauren Davis won the inconsequential doubles rubber 6-2, 6-3 over Nastassja Burnett and Alice Matteucci. Italy will advance to the quarterfinals, while the US will be attempting to simply avoid relegation from the World Group in their next outing. Posted in: Fed Cup, USTA, WTA. Tagged: 2014, christina mchale, Cleveland, fans, fed cup, Interview, Karin Knapp, mary joe fernandez, Tennis Panorama, Womens Tennis, wta. Sochi has nothing on Cleveland. It’s 7 degrees outside of the Cleveland Public Auditorium. Remember the Australian Open, where players were frying eggs on court? We’re freezing water out front in record time. Almost as dramatic. You’ve got the bitter cold and you’ve got the international competition, without all of the homophobia. Join me for Fed Cup Cleveland Day 1 as I cover the event the only way they’d let me in: for Tennis Panorama News! First, we show Tennis Panorama Karen that we dressed up nice and show those Italians we’re not a bunch of sweatshirt-wearing media buffet hogs. Then, we meet a Super Cleveland Tennis Fan. Then, Team Italy Karin tells us about the most rabid fans of all: her own teammates. After that, we drop the news on Cap’n Mary Joe Fernandez that the USA is 0-10 after starting 0-2 in Fed Cup World Group play. Posted in: Fed Cup, USTA, WTA. Tagged: 2014, Camila Giorgi, Cleveland, Day 1, fed cup, Italy, Karin Knapp, madison keys, recap, usa. 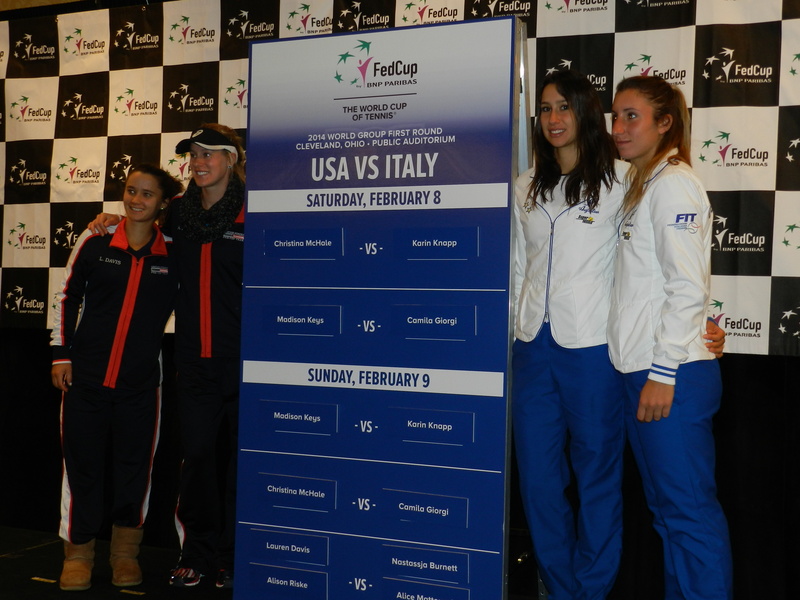 Team Italy blanked the USA on Saturday in Cleveland, Ohio, to take a 2-0 lead in Fed Cup first round action. Christina McHale played a horrendous first set, ceding second serves to Knapp. Knapp’s powerful backhand threatened to make the match a runaway for the Italian. McHale settled down in the second and broke twice to level the score at 6-4. 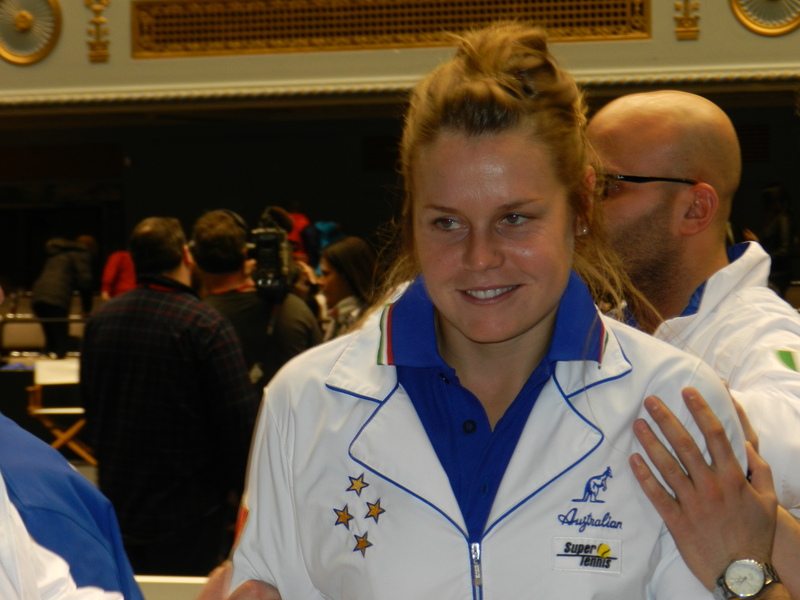 The ultimate result was a big bang for Italy with a victory by Karin Knapp in three sets, 6-3, 3-6, 6-1. 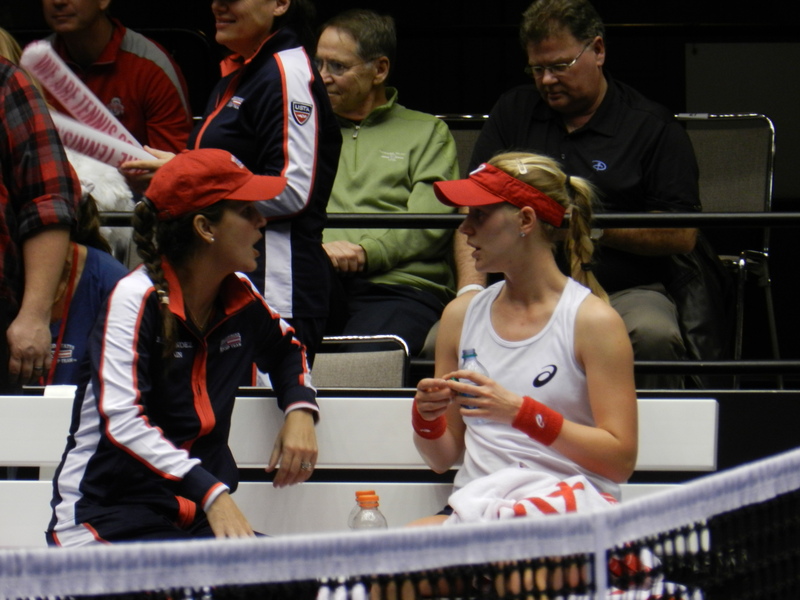 McHale ran her Fed Cup career record to 5-3 with the loss. The Italian team was especially loud and supportive. Karin Knapp acknowledged that she feeds off of them and predicted that they would feed off of her win. “We are not a lot, but we are loud. They helped me”, she said. “They gave me confidence”. Maybe you’re right, Karin Knapp. As predicted by Knapp, Camila Giorgi did come out relaxed…and focused. Giorgi thrashed Madison Keys 6-2, 6-1, notching a victory for the Italian in her first Fed Cup rubber. Keys seemed to be confused and having one of those days, and she was unable to hold serve on a regular basis. Giorgi said it did help her composure knowing that her nation was already on the board before she hit her first ball in a Fed Cup. Keys summed it up best. “She was playing amazingly. I can only control so many things. Great job to her today”, she said. The Americans are now in danger of losing a fourth straight tie to the Italian Team dating back ten years. They’re 0-10 in ties where they’ve started with a pair of singles losses. But US Captain Mary Joe Fernandez has every reason to believe that this team, at least on paper, should have a realistic shot at pulling a sweep of their own tomorrow. I agree. Posted in: ATP, olympics, USTA, WTA. Tagged: 2014, atp, Cleveland, fed cup, Hate, Ohio, olympics, washington, wta. If you’re a tennis blogger, you probably already know what I’m going to say. No one pays attention to this blog or anything else during the Olympic Games. In 2011, we had a rich field for ATP Washington, forever known to me as the Legg Mason Tennis Classic. It was my first ATP event, and what a field it was. An epic late-nighter between Gaels Monfils and John Isner was just one of the big matches featuring marquee players. In 2012, they all went off to the Olympic Games and no one retweeted my gunk at the player-hobbled event. The Winter Olympics surely couldn’t steal the tennis thunder this time, right? I mean, they don’t play any tennis in the Winter Olympics! Doesn’t matter. I was in a nearly empty ballroom at the Cleveland Marriott yesterday for a Fed Cup draw ceremony as the Opening Ceremonies of the Winter Olympics were starting. OMG: Press only asked ONE question to the Italian team until an almost exasperated USTA official begged and squeezed a couple more to bring the entire press conference to a whopping three minutes. “Really? Really? You have NO MORE questions?” Time for a sympathy question. 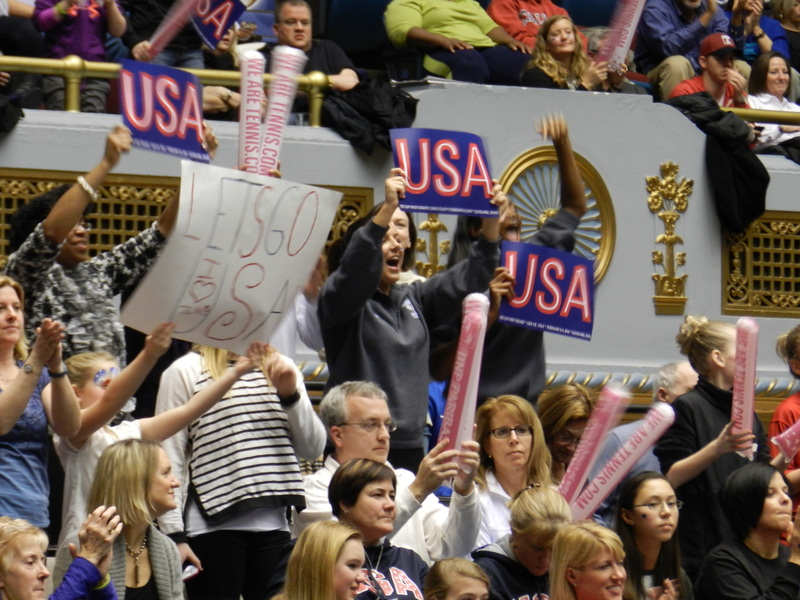 Americans don’t exactly flock to Fed Cup to begin with. Somehow, to the US of A, a non-medal curling match gets better ratings than women’s tennis. It would seem that the average ‘Merican sports fan would rather watch paint dry than watch the US thrash Italy this weekend. Look. I’m in a 7 degree climate here in Cleveland, and that makes it even worse. Sochi looks like the tropics from here. Maybe we can get an ice tennis exhibition on Lake Erie between Madison Keys and Christina McHale to steal the spotlight. The USTA should seriously consider this kind of Winter Classic. Because I now hate the Olympics. Posted in: Fed Cup, USTA, WTA. Tagged: 2014, alison riske, Browns, Cleveland, fed cup, Pittsburgh Steelers, tennis, toronto, usta, women's, wta, Yves Boulais. Alison Riske grew up in Pittsburgh, a mere two hours from Cleveland, but this week marks the first time the 23-year-old has ever been to this nearly-neighboring fair city. 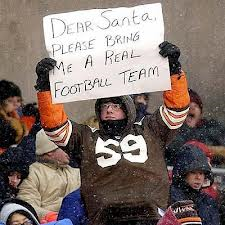 As a die-hard Pittsburgh Steelers fan, Riske is jovial and simultaneously serious about her love of the Steelers spoiling her desire to camp out in Cleveland. “Never came. It is Browns territory, so I’m like ‘I’m not setting foot over there’. The World #46 admitted this without hesitation when I caught up with her outside of the Grand Ballroom of the Marriott at Key Center on the eve of her maiden Fed Cup voyage as a player. Riske was a designated hitting partner six years ago as a 17-year-old at the US Fed Cup tie in Moscow and appreciated the experience. “I got my feet wet. I think that was the whole point of being a ‘Future Fed Cupper’. Riske joins Cleveland native Lauren Davis in the fifth and final rubber on Sunday in doubles against Alice Matteucci and Nastassja Burnett. It could be crucial. Though she can cross ‘Fed Cup’ off of the old Bucket List for now, she says she’ll gladly come back and play singles anytime. FUN FACT: Riske is the only regarded WTA player who lists Washington, DC as her address. But she’ll be filling out a change of address form sometime soon. She’ll head to Toronto to rejoin her coach, Yves Boulais, who she followed to the Junior Tennis Champions Center in College Park, Maryland a year ago. She will train full-time in Canada. Boulais left Maryland and returned to College Park late last year. She credits him for muchof her success.